There’s a new way to get your kicks in Kansas City, thanks to the rise of an increasingly popular sport known as foot golf. The game, which has now infiltrated the KC Parks system through the Heart of America Golf Course, is structured just like golf. There are 18 holes in a round, a course par of 72, tee boxes to begin each hole, and flagsticks marking the cup. 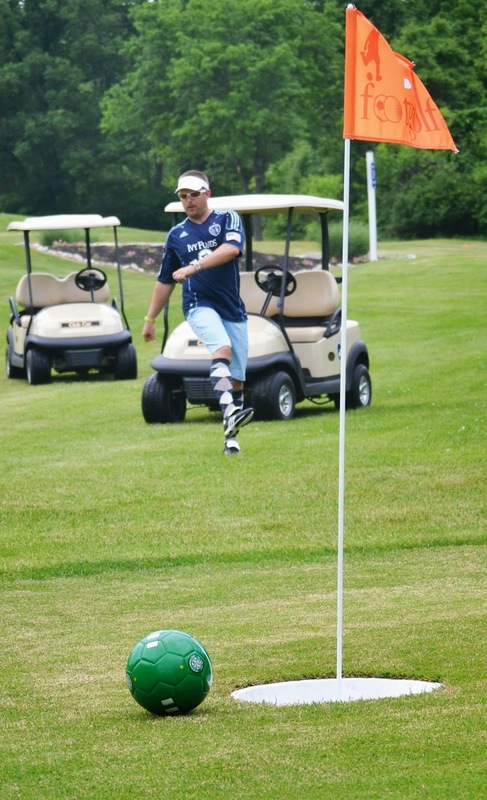 But there is one significant difference: foot golf is played with a soccer ball. The sport was originally founded in Europe around five years ago, and has recently picked up in America, specifically along the west coast. So when Heart of America brainstormed ways to increase revenue while offering new services to Kansas City residents, the idea of foot golf came up. By the beginning of May, enlarged holes had been installed alongside the Heart of America par-3 course, new foot golf tee boxes had been set up, and thousands of foot golf scorecards had been printed. Foot golf had officially spread to Kansas City. Typically, foot golf holes are about half the distance of a regular golf hole. Martin guessed that the longest hole was about 225 yards. So far, the course record is a 63, although more and more players come in every day to challenge that mark. Last weekend, the course was jam-packed with dozens of competitors in town for a kickball tournament. Martin added that the burgeoning new sport generally attracts a less competitive clientele than golfers. It’s easy for newcomers to grasp, and at $10 per round, it’s affordable enough for families to come out for an afternoon. Interested parties can even set up a “toe time” with the course to ensure that there’s availability. And those aren’t the only perks. Martin and his colleagues at Heart of America hope to continue growing the sport of foot golf throughout the summer. They’ve looked into hosting tournaments at the site, and have already set up one league, scheduled to begin in mid to late June. They want to expand the sport even more, and are looking for feedback from their first wave of foot golfers to help mold services to the will of the people. For now, Martin is focused on the possibilities. While golfers typically lay down their clubs throughout the winter months, Martin envisions foot golfers enjoying the sport almost year-round. After all, soccer is played in all conditions, rain or shine. The foot golfers helped proved the theory last weekend, when the kickball group played right through a brief drizzle. Foot golf has been an experiment so far, but it’s worked well enough that Martin foresees it sticking for the long haul.